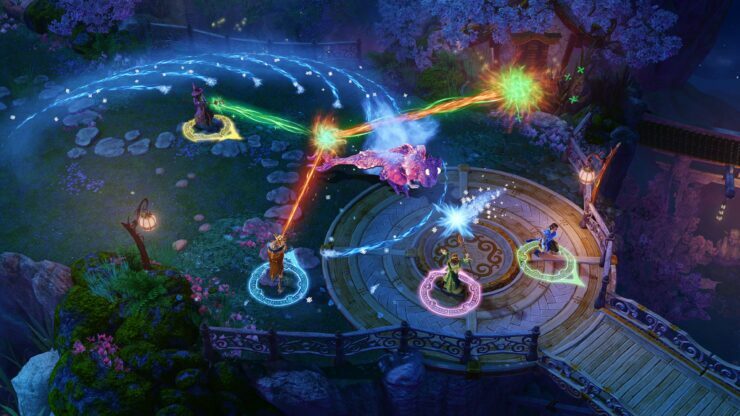 The folks at Frozenbyte are about to release Nine Parchments, a new magic themed “cooperative blast’em up game”, later this week on PC, PlayStation 4, Xbox One and Nintendo Switch (where you can already find a demo via eShop). We’ve contacted them for a brief interview and as usual, we inquired about the game’s technical specifications on all the platforms. You can find out all the relevant information below; with regards to PlayStation 4 Pro, Frozenbyte said that currently there is no difference with PlayStation 4. We’ll post our full interview with Frozenbyte tomorrow – stay tuned. Are you using the same engine seen in Shadwen and Trine 3? Which technical improvements were you able to add this time around? Yes, we are using the same engine with some minor improvements all around. Mostly they are on the usability side, so tools that make our level designers jobs more efficient, but also we’ve added Xbox One and Switch support since those days. On PC, do you plan to make the game compatible with Mac OS and/or Linux at some point? Right now it does not seem all that likely with the current engine that we are using. After Nine Parchments wraps up, we are updating our engine and renderer to the next generation, so a lot of big changes will be made and we are a bit short on Mac and Linux programmers at the moment. Will Nine Parchments support HDR on platforms like PlayStation 4, Xbox One S/X and PC? We won’t have HDR support, but Xbox One X and PC will be capable of 4K. Can you share the technical specs of the game (graphics resolution, settings quality, etc.) running on PS4 Pro and Xbox One X, respectively? Also, are you targeting 60 frames per second on all platforms? 1080p/30fps on Switch docked / 720p/30fps undocked.